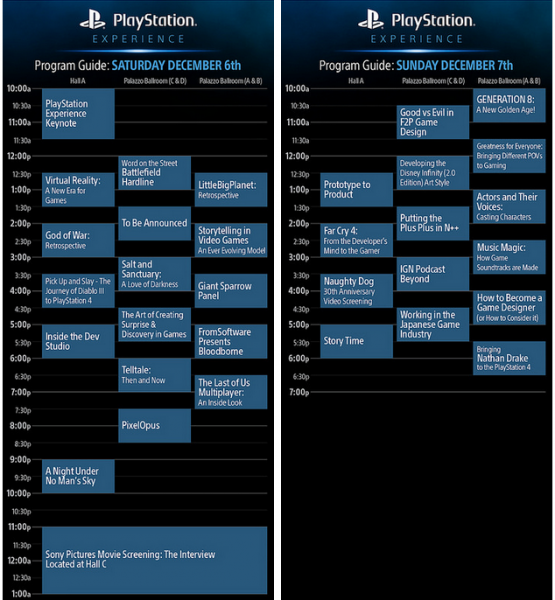 For those of us not lucky enough to attend PlayStation Experience live and in person this weekend, Sony has revealed the full schedule of panels and more that will be livestreamed during the event. Unfortunately, a lot of big events won’t be livestreamed, including Naughty Dog’s panel on bringing Nathan Drake to PlayStation 4, an inside look at The Last of Us’ multiplayer, a Night Under No Man’s Sky, and the early screening of The Interview movie with James Franco and Seth Rogen. Are you attending The Game Awards or PlayStation Experience?